A-Class owners will feel right at home. We’ve known for a while now that , known as the GLB. have shown its boxy exterior, but this time our spy photographers managed to snap some shots of the interior, giving us a first look at the GLB’s cabin. Being based on the same platform as the new A-Class, it's hardly surprising that the dashboard looks virtually identical to the one found in the entry-level sedan. The center console looks slightly different and boxier, but the dual 10.25-inch screens and air outlets look very familiar. Like other modern Mercedes vehicles, expect the GLB to also come with the automaker’s new . On the outside, the similarities are less obvious as the GLB is considerably bigger and boxier than the A-Class and indeed the GLA crossover. 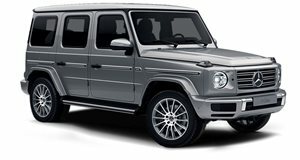 We still think the overall design looks more like a reborn GLK than a baby G-Class, though, but we’ll reserve judgement until the covers come off the production version. This is, after all, still a work-in-progress prototype. Presumably, the engine from the A-Class will be carried over, so expect the GLB to be powered by a 2.0-liter turbocharged inline-four that produces 188 horsepower and 221 lb-ft of torque mated to a seven-speed dual clutch transmission. According to , the GLB will arrive in US showrooms in Q4 2019 available as a five-seater with an optional seven-seat configuration. As part of a joint venture between Daimler and Nissan, production will take place at a new plant in Aguascalientes, Mexico.